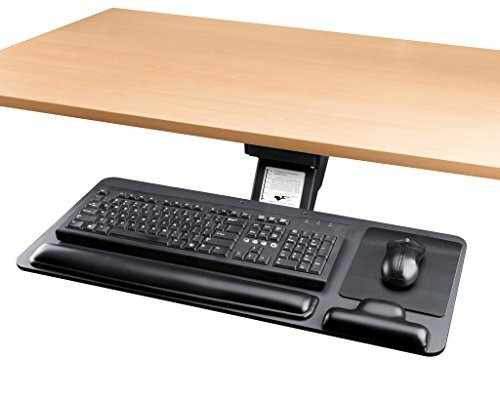 No longer need to buy an additional computer desk, you can have a free to adjust the location of the computer desk, unlimited possibilities. The bottom of the platform of the protrusions, not only can prevent the keyboard slide, but also let your hands rest place, reduce the work brought about by the tired. You can easily adjust the standing desk to match your specific height requirements. A reasonable platform for the distribution of space, you will not waste the money, so that every inch of the platform are useful. Manual adjust: pull or push plate to adjust the horizontal position of the tray, picked up or down plate adjust plate high position, left and right movement to adjust the Angle of plate rotating the handle. Adjustment range: The adjusting height is 5.9''(150mm), plate can be from higher than desktop 0.8''(20 mm) to lower than the desktop 5.1''(130mm), Plate surface inclination Angle range is ±15°. Measure Desk First:The platform is 26.7'' (680 mm) ×11.4''(290 mm) and the track length is 18.1''(460mm). Make sure your desktop is big enough.It's made by Phenolic Resin and can support your arms strongly. There is GEL wrist rest for keyboard and mouse.Let you no longer worry about the narrow worktop by using this keyboard tray under desk. Simple operation: Adjust the panel height only need to pick plate up and down and gently rotate handle can adjust the keyboard plate angle. Solution of occupational diseases: choose comfortable position, no pain. If you have any questions about this product by Cartmay, contact us by completing and submitting the form below. If you are looking for a specif part number, please include it with your message.